Best suited for the laser manufacturers who want a controller suitable to be built directly into the laser. 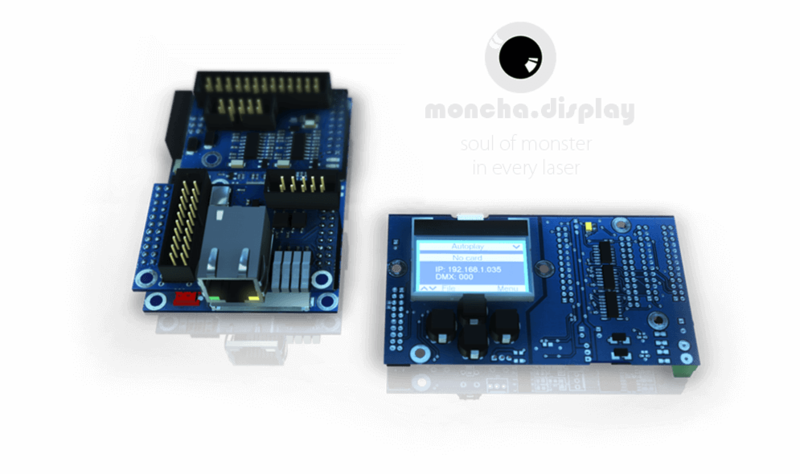 Why should you use the latest moncha.display? Moncha display offers a large number of standard outputs and inputs as DMX in/out, ILDA in/out, Ethernet, SD-card and display.Display gives you option to do setup direct on laser device. One of the greatest benefits is that the display allows you to see, control and change all laser device settings directly on the device without using any software. Of course there is a safety key which gives you the ability to lock the laser and prevent unwanted use. Your laser will become complete solution – customer doesn’t need anything else to start creating amazing laser shows. Your laser will provide multiple ways of control: Ethernet, DMX, ArtNET or even stand alone. Your customer never forgets his laser show controller at home. No more expensive and impractical ILDA cables. Use Ethernet or even Wi-Fi instead! Set all important features using practical display and keys integrated directly into the Moncha.NET board. Stable Ethernet control of 50 and even more lasers directly from computer software. Naturally, there are all kinds of connectors available, from DMX in/out or ILDA in/out to Ethernet, and Display. Moncha Display offers you, on top of easy-to-read 1.75 inch display, all of the inputs and outputs you could possibly need. Included are of course also DMX in/out, ILDA in/out, Ethernet and an SD-card. Through these you can simply establish connection to or from the device. Why use integrated ILDA input? In case you wish to use other devices (different hardware) than Moncha, you can utilize ILDA output. ILDA output enables you to keep all the basic settings such as inverting axis or safety key.